If you want to improve the ability of your blog to grow your business, you need to focus on creating content that converts. In simplest terms, a conversion is an action that the customer takes as a result of interacting with your content. There are many actions the reader can take when interacting with your content, and your content should be tailored so that they take the action (conversion) that you want. This is the biggest conversion-killer of all. Think about that strategy; building awareness. Literally, that means you are trying to make people aware of your business, through your blogging efforts. So if you are trying to attract people that don't know who you are and don't know what you sell, what's the one thing your content can NOT do? Think about it: If I am unaware of who you are and what you do, why would you waste my time and yours selling your product to me? I don't know who you are, I don't know what you do, and I don't know why I should care. So clearly, selling to me is the worst thing you could do. It wastes your time, and mine. And yet...this is precisely what most companies do that adopt a 'build awareness' content strategy, they create content that sells. We're Not Like Those Guys, Our Content NEVER Sells! This is the second biggest reason why your content never converts; Because when the customer actually IS ready to buy, your content doesn't move them closer to a sale! 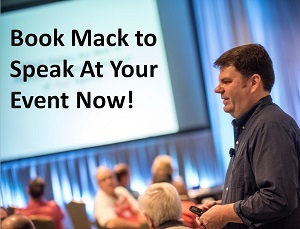 You've been beaten over the head with the 'social media is about relationships, not selling!' club so much that you go too far the other way and NEVER sell with your content. I don't blame you for this as much as I blame the 'social media purists' that push such nonsense. Of course your content can sell. You simply have to understand where the buyer is on their journey, and create the content they need today, with a bridge to the content they will need tomorrow. 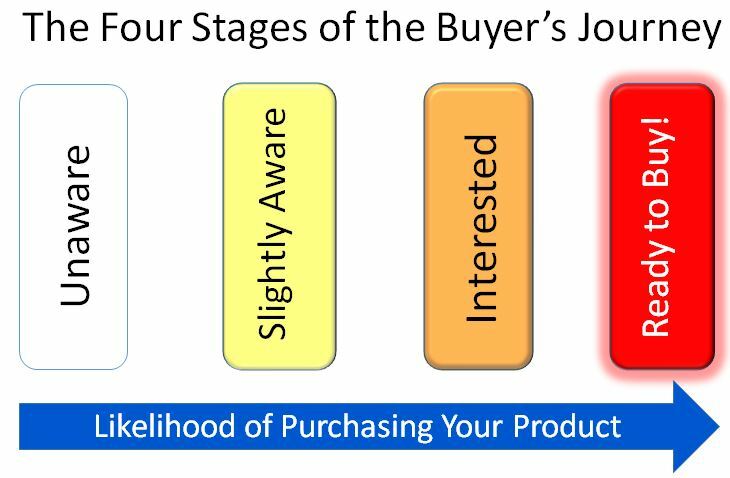 This is the Four Stages of the Buyer's Journey. I'll be going into all four in much greater detail in a post later this month. But for now, let's focus on two things; the first and last stage, and the color of each. First, note that the color of each stage is different. The color gets 'warmer' the further you move to the right, to signify that each stage moves the reader closer to being a buyer. It's also a visual reminder to you that when the reader is Unaware of who you are and what you do, they are also completely cold to your effort to sell to them. So don't even try. Second, note the first and last stages. As I said, there are two main reasons why most content doesn't convert. It's because you create content that sells when the customer isn't ready to buy, then when they are ready to buy, you don't sell to them. If your blog's goal is to 'build awareness' of your business, then don't blog about your business, blog about the customer you want to do business with! Sounds counter-intuitive, right? It isn't, this approach works because you're creating content that attracts the people you want to do business with! Let's say your company sells lawncare products. If you write a post titled "Five Pests That Are Keeping Your Lawn From Being Beautiful", that post would appeal to homeowners that want a beautiful lawn. A homeowner might read that post and think "Hey! My lawn has those brown spots, so THAT'S what causes them, I had no idea!" Then they will start to investigate your site and LEARN more about your products, but it all started by creating content that was focused on the customer, not your brand. This content should only focus on the customer. Specifically, you focus on your customer's life, without selling your product. A good way to think of this content is creating content that teaches your customer the skills that also compliment your product. In the above example, you create content that helps the customer have a more beautiful lawn. Ultimately, this is the problem that your product solves, so create content that focuses on the problem, and that gives the customer advice on how to solve it. That gains their attention, and can eventually give you a way to promote your product to them! In general, the less interested the customer is in buying, the more your content should focus on the customer. The more interested the customer is in buying, the more you should create content that's technical and focused on the product. Just remember to give them a way to actually BUY the product! Well said. I’ve seen a number of websites that have a blog that doesn’t really speak to someone coming to the website. This is great advice even to experienced writers and content managers. Thanks Andrew, BTW I checked out your site, very slick, great job on it! Awesome info. Intent of the search can be so important. I dealt with a site that was getting about 3,000 visits a month from organic searches and ranked high for a general high volume keyword. But the search intent was from people just looking for pictures of the products. Traffic declined over time to about 600 visits/month. Yet sales increased even though traffic was way down because those searches were closer to the “ready to buy” point of the process. Hi Nick, great example of how you have to look at all your stats in totality. Also makes perfect sense that people looking for product photos would be in the research stage or Interested. Another good reminder of how important it is to add the proper keywords and phrases even to your images, especially product-related ones!